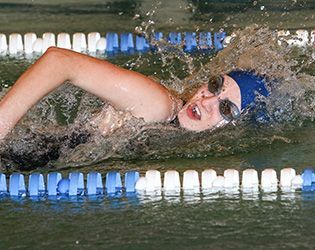 On Saturday, the varsity boys' and girls' swim teams took part in the highly-competitive Pirate Invitational at West Windsor-Plainsboro South High School. The girls' squad placed eighth among the 11 teams, and the boys placed ninth. Several GSB swimmers also recorded season-best times at the event. Highlights for the girls' team included freshman Rebecca Michaels qualifying for finals in the 200m freestyle and 100m backstroke and a sixth-place finish for the 400m relay team of Caity Hepplewhite '20, Caroline Grant '20, Sabrina Sukhin '18 and Emily Supron '17. On the boys' side, the relay teams recorded season-best times in the consolation finals. Swimmers return to the pool this Thursday when they take on Morristown-Beard on the road.